Description:The play area is an environment that encourages physical as well as imaginative play. The interior scenery is set with bright colors, which creates a fun and inviting atmosphere. Our indoor playspace is an air-conditioned oasis on those long hot summer days and a warm embrace on the cold and frosty ones. It provides most of the amenities of your local playground (slides, sandbox, tree house, and playhouse). Parent or caregiver must supervise their child. Please click on a star rating for Indoor Play. 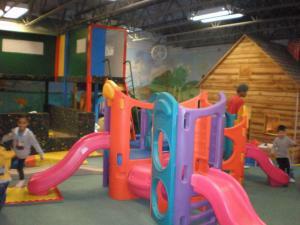 Please type your review for Indoor Play.